Can we adjust the delivery date based on the city selected on our form? I know want to add various Cities to my form. I want people to be able to choose from Austin, Houston, San Antonio, or Dallas. Depending on what city select, they will only be able to chose certain days for delivery. If they select Austin: Only delivery dates are 11/17 and 11/18, etc. Can you please tell us a bit more details since the previous thread contained several different subjects and I see that you have additional threads as well. 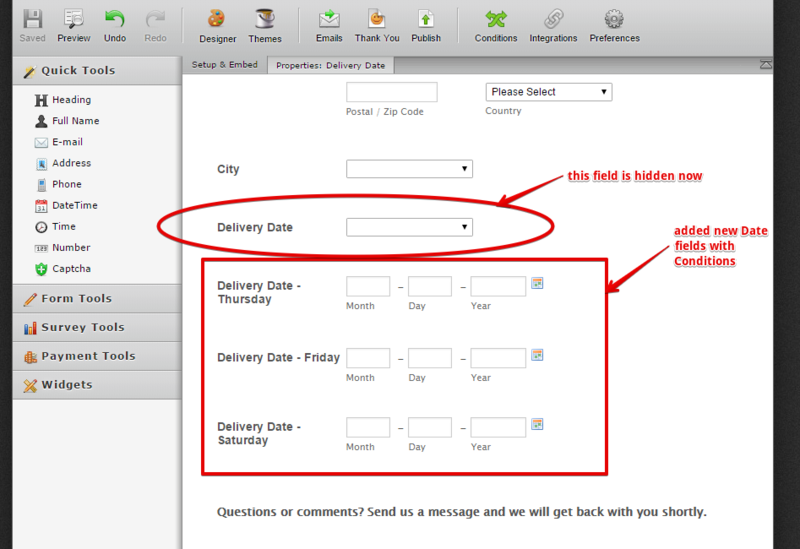 The detail that I am asking about is to check if you want your user to enter the address into the Address field, and based on that value to determine the date of delivery? Or do you want to have a specific field for several different towns / cities of choice - to which you deliver? Yes I will try my best. Good question. I want the address field to be there regardless. I have sense added a dropdown menu for city. Based on their selection of the city, I want certain dates to show up. 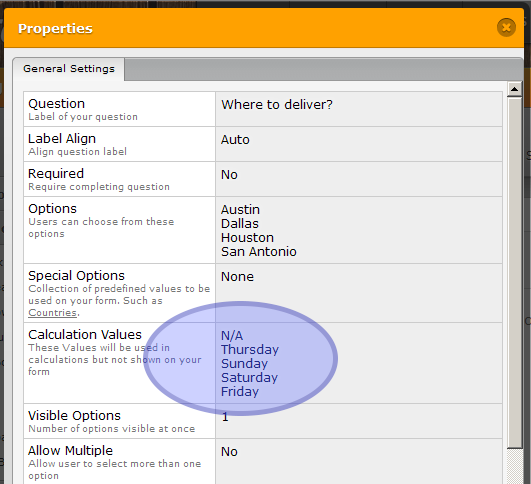 For example, if they select austin I only want Thursday to be a delivery option. If they select san antonio I only want friday to be a delivery option, if they select Houston I only want Saturday to be a delivery option, if they select Dallas I only want sunday to be an option. This the general idea. I can decide exact dates later. Can this be done? 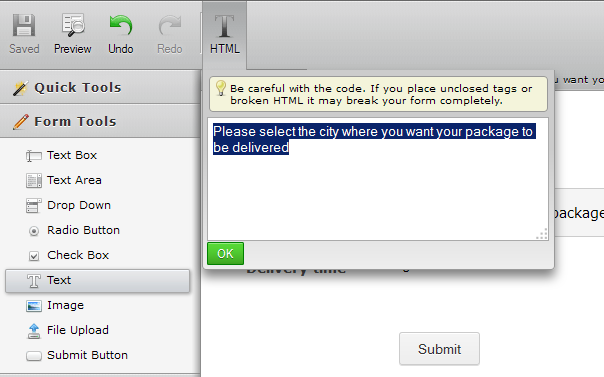 I know it's repetitive sense they are adding the city in the address field, but I'm not sure how else this can be done. 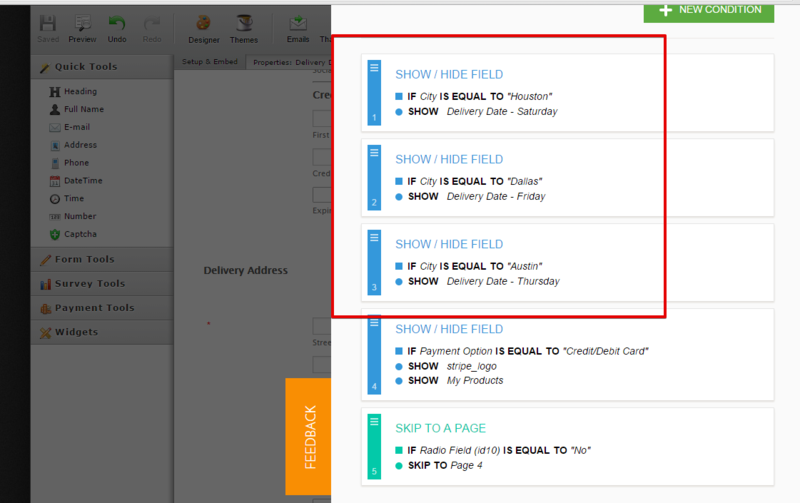 With the dropdown, this allows us to not need to touch the payment tools, but just use the data that we need. Now based on what you have said, there are 2 ways to do this. Now I think that the Form Calculation is much better option since it allows you more freedom during the setup of this and with a bit of CSS we can make it look just as we want. The steps however are similar no matter what is the form, so let me go through them. 3. Set the calculation values to represent the days that you wish to have each city show. * You have probably noticed the N/A at the top - we need to add something for the empty option shown by default in the dropdowns and we will add the condition that will make it not shown at any time, so it does not matter what it is (but can not be space or empty row). 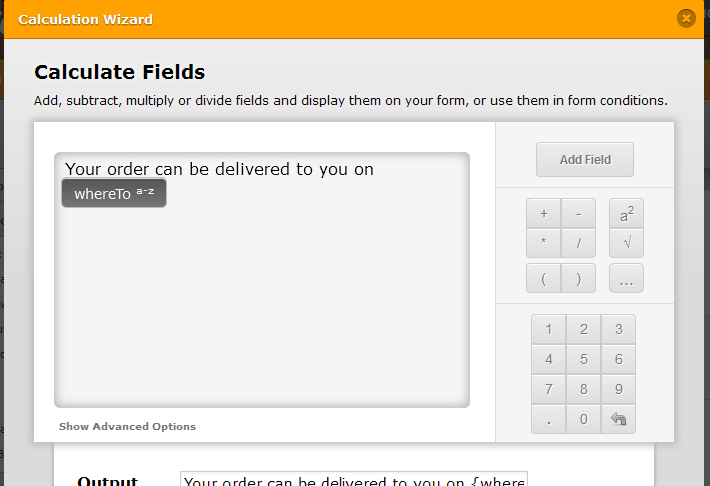 Once it is black - we have it just as we want it and we can close the Form Calculation wizard. Once you add the text just hit that green OK. In all honesty I don't really have time to learn this. Can I pay you to help me or something? This is more or less going to be a one time thing so I am focusing my efforts on other aspects of the business. Also, this is pretty much the last thing I want to add to my form. I would greatly appreciate it if you can help me out this this. Normally I would figure it out myself but I am very strapped for time. I checked your current form setup and I see two drop down fields labeled "City" and "Delivery Date". 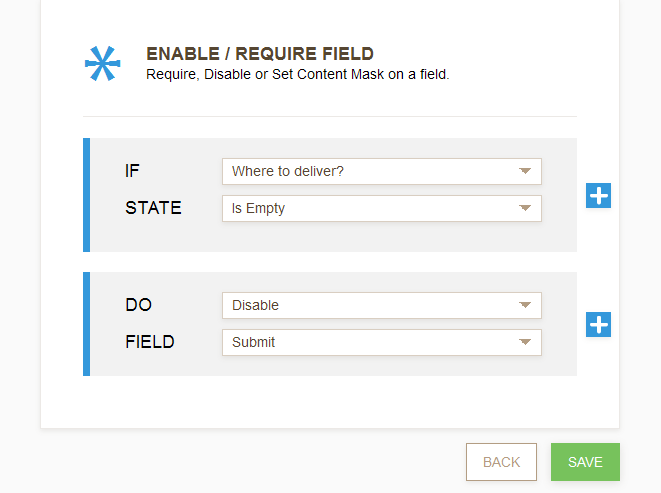 As of this time, we do not have any feature that removes or disable the drop down field options base on the selected value from another field. 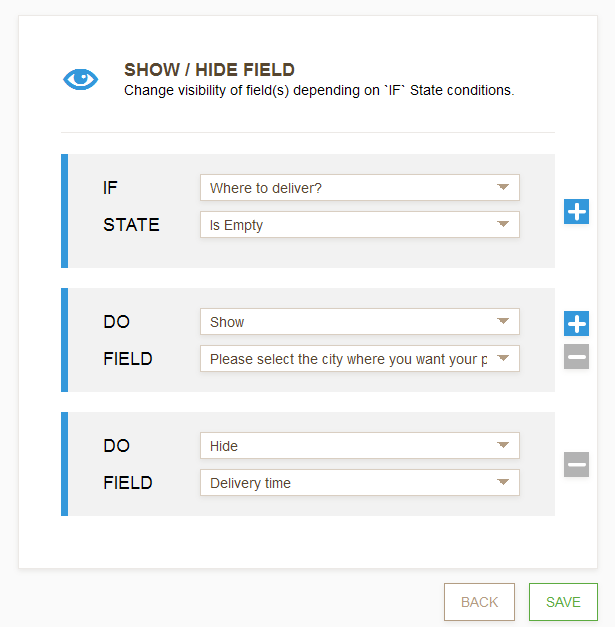 However, there's an available workaround for that using the show/hide condition as also suggested by my colleague. However, this time I suggest to use DateTime field (under Quick Tools) so it is easy for your users to pick a date with a limit of course and so you will not update the dates on the dropdown field manually as the days goes by. Then open the properties on each of these date fields (Right click > Edit Properties) then set its calendar limit to only allow specific days to be selected. 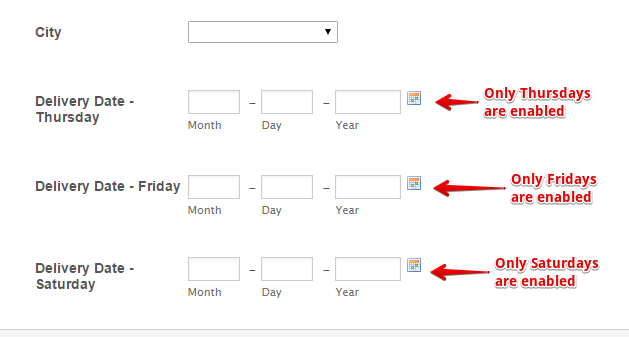 Example, if you want the date field to allow only Thursday date to be selected, then uncheck everything on the Days of the week except Thursday like this. 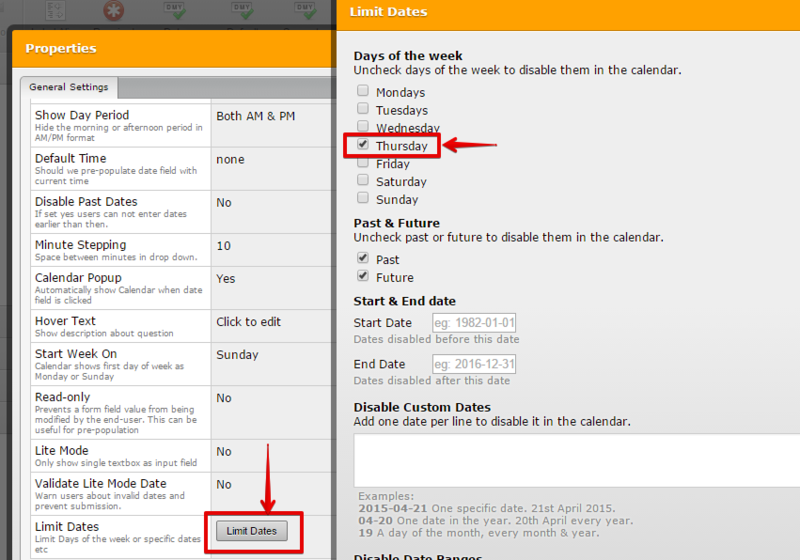 You need to do the same for the other date fields then uncheck which days you want to disable. 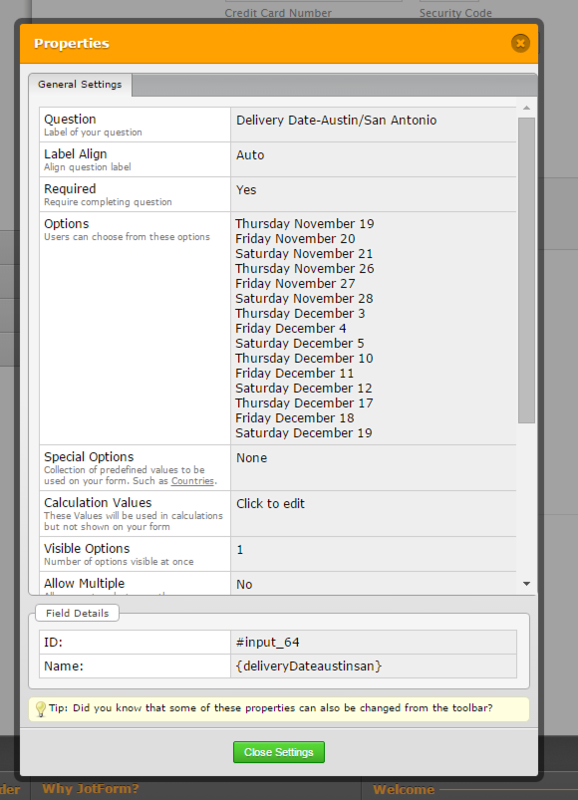 If City is Equal To Austin, Show Delivery dates with only Thursday enabled. Here's a clone of your form which I have these applied https://form.jotform.com/53203403057948?. 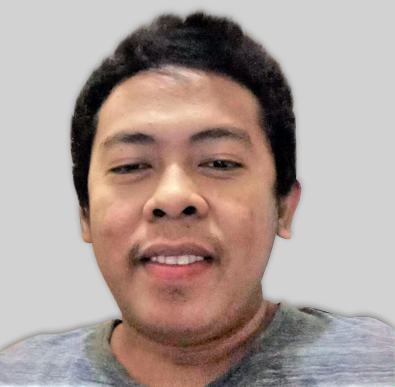 Feel free to clone this form and use it if you like. I don't have check boxes on mine. I apologize Mike, but I am not quite sure what you mean by checkboxes? I took a look at the form made by my colleague above: https://form.jotform.com/53203403057948 and I see dropdown to select the city and DateTime widgets as mentioned in his reply, but no checkboxes that you are referencing. Ok I see what you mean. I don't want to clone the entire form though, just the portion for the city and delivery date like we are discussing. How can I do this? Better yet, can you put the city/date info we are discussing in my form called "Social Ice?" That would be much easier and better for me. I am doing the transformation for you. I will update this shortly when done. I have made the changes needed to your jotform https://form.jotform.com/53056493768164? Since it has an existing submission that uses the 'Delivery Date', I cannot remove the field. So I had it hidden from the form so that the submission data will not be deleted. I have added the Conditions needed so that the form will use the newly added specific Delivery Dates base on 'City' selected option.